At the same time when I started writing this blog I also became active on MSDN forum, where I am trying to help SQL users to resolve theirs database issues. One SQL Server 2012 and one linked MySQL server. 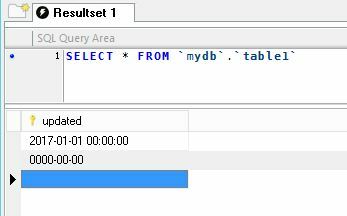 Problem is that MySQL server accepts datetime values in the format of “0000-00-00”, but that will be equivalent to NULL date value in SQL server. And I will get an error. Bear in mind that this is just workaround solution.